Timeless Cool®: John Hardy Donates Timeless Cool Hijau Cinta Cuff for "Bid to Save the Earth"
John Hardy Donates Timeless Cool Hijau Cinta Cuff for "Bid to Save the Earth"
Another fabulous piece of jewelry donated to make a difference in this world...thank you John Hardy. Luxury handmade jewelry brand, John Hardy, donated a stunning Hijau gold cuff, from their custom Cinta collection, sold at the Bid to Save the Earth auction hosted by famed auction house, Christie’s. “’Bid to Save the Earth’ is so important because it doesn’t just build awareness, it takes the initiative to actively work to build a healthier planet,” said Guy Bedarida, Head Designer and Creative Director of John Hardy. 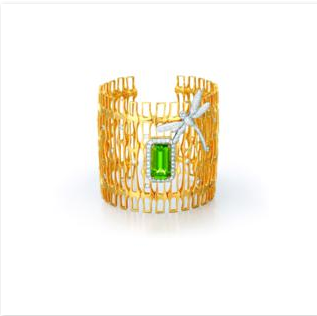 The Hijau (meaning “Green” in Balinese) Cinta cuff is made of 18K gold with a stunning, green peridot center stone encircled by diamonds and a diamond dragonfly, with a retail value of $40,000 for the ‘Bid to Save the Earth’ event. The event was hosted by a celebrity studded committee that included both Bedarida and his muse, model and environmental activist, Angela Lindvall. The proceeds from the sale of the cuff and other luxury items sold at the event will fund some of the world's leading science-based, results-oriented non-profits, including: the Natural Resources Defense Council (NRDC), Oceana, Conservation International and the Central Park Conservancy.